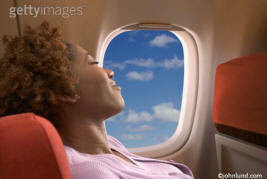 A successful example of having an interior space on hand can be seen in a stock photo of a woman sleeping happily on a commercial jet. I am always on the look out for source material. While walking along a pedestrian path along the shore of San Francisco bay I encountered a sailboat that had broken loose from its mooring and was beached while the tide was out. I didn't know how I was going to use it, but I photographed the boat any way, and from a variety of angles. About six months later I was photographing rough seas off the Coast of Marin County (at Rodeo Beach) when it occurred to me I could composite the sailboat into the seas and create an image illustrating danger, risk and challenge. It turned out that the sea wasn't really rough enough, so I used the waves I had photographed to create a stormier sea. I used a sky I had photographed years earlier in Santa Fe, New Mexico. I stripped out the sailboat, including all the various lines (ropes and wires) using clipping paths in Photoshop. 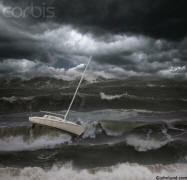 Then I pasted the boat into the waves and used a layer mask to make it look like the boat was actually in the waves. Recently I have created numerous stock photos from images that I have “collected” to have on hand for future inspiration. In another such case I decided to create a stock photo from one of a number of road pictures I have taken over the years. After opening the file in Photoshop I used Bridge to look through a folder of potential images I keep handy. A picture of a brick wall I had shot some months earlier in a Berkeley neighborhood caught me eye. 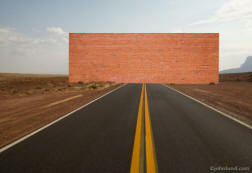 It was a simple matter to select the brick wall and insert it into the road picture. The process took about half-an-hour and cost me nothing. The result was a stock photo accepted by Getty into The Image Bank brand. One thing that I am trying to “collect” more of is interior spaces. I cringe when I think of all the interiors I have photographed in over the years and failed to take advantage of them. Now I make it a rule to shoot any space I am shooting in with an eye towards using it in a future composite. A successful example of having an interior space on hand can be seen in a stock photo of a woman sleeping happily on a commercial jet. In this case the picture I took of an empty seat across the aisle from me on a flight back from Bangkok was the inspiration. I began with that image and hired a model to pose for me in my studio. I stripped her into the seat and put a picture of a blue sky from my files into the window. The result is a stock photo which has been licensed numerous times as a Rights Managed image. 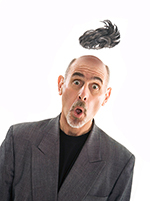 You just never know what image is going to work…or how it is going to work. 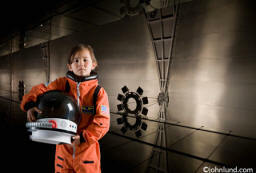 An image shot of the ceiling of an airport became a great backdrop for a child astronaut. Turned on its side, the ceiling became the perfect high-tech background for a space facility. Creating a library of likely, and even unlikely, composite parts, is a key component of my stock plan. When I find a likely place or thing I try to get a variety of angles and elevations, as I never know just how things might go together.